When I reviewed "Chess by Post" in November, I mentioned in the comments that the idea of playing with people around the world one move at a time and then waiting for the reply, would be great for a Scrabble type game. Of course, developer Jeff Cole now has another "...by Post" game: "Words by Post". I said then it would go on the reviews list, and since that moment, I've not stopped playing. Let's be strict here, this is not Scrabble. At first glance, the seven tiles on your letter rack, being placed on a board with double and triple letter bonus squares alongside double and triple word squares, might seem the same, but you'd be wrong. 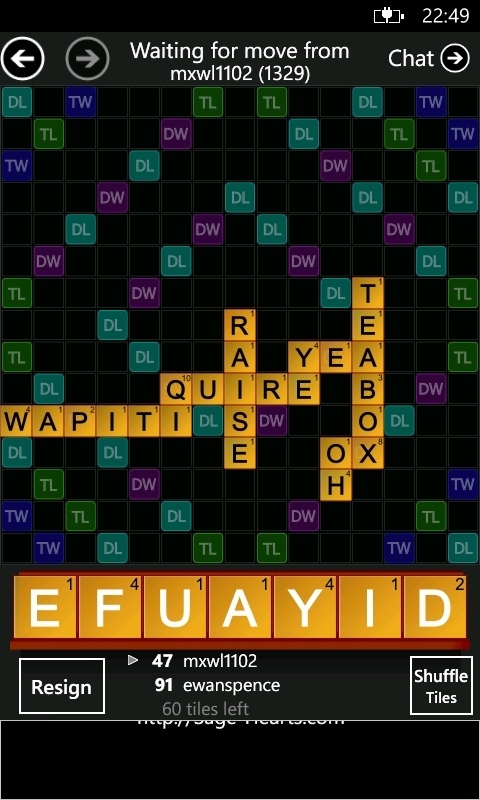 Just because it has a 15x15 board, an eerily reminiscent letter distribution table, and the annoying "X" to get rid of at the end of game... no Mr Lawyer, this is not Scrabble. Putting that aside, just like Chess by Post, Cole has an interface that allows you to choose who to play around the world. 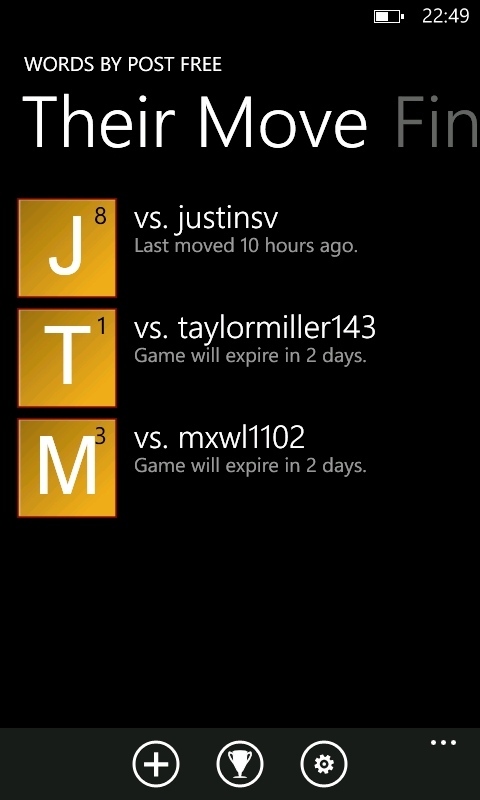 You could pick a friend from your People Hub, invite them by email to play (or download the application, available for Android and iOS devices as well as Windows Phone); you could search for a specific player by their username ("ewanspence" if you want to beat someone up through long words); or you could have Words by Post pick an opponent for you of a similar skill - which is my favourite option. This ranking is done by the ELO method (whoever has the username 'Mr Blue Sky' wins? - Ed), where everyone starts with the same score (1200 in this case) and you gain or lose points depending on the strength of your opponent. It works well, and the more you play the more likely you will find the right level. As you improve, the game improves with you, acting as a self-regulating difficulty curve. In fact, the mechanics of the long distance game and interface in Words by Post is exactly the same as in Chess by Post. It was almost perfect in the latter, and it's just as successful in the former. 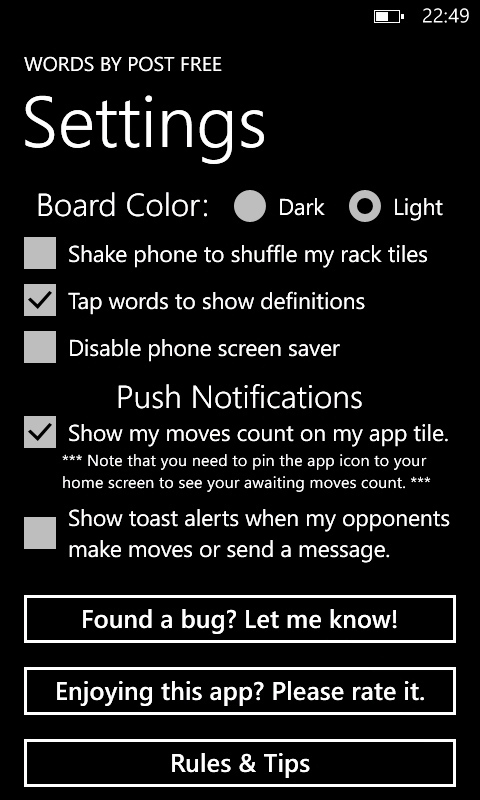 Settings for the game are mostly around how you will be alerted to a new move - and you can choose the push notifications to appear on a live tile, through the "toast" alert bar at the top of the screen, or both. I also like the option of looking up word definitions from the game board, and the ability go with a light or dark board graphic. Playing the game is much like the real world, albeit with a board you can zoom in on. 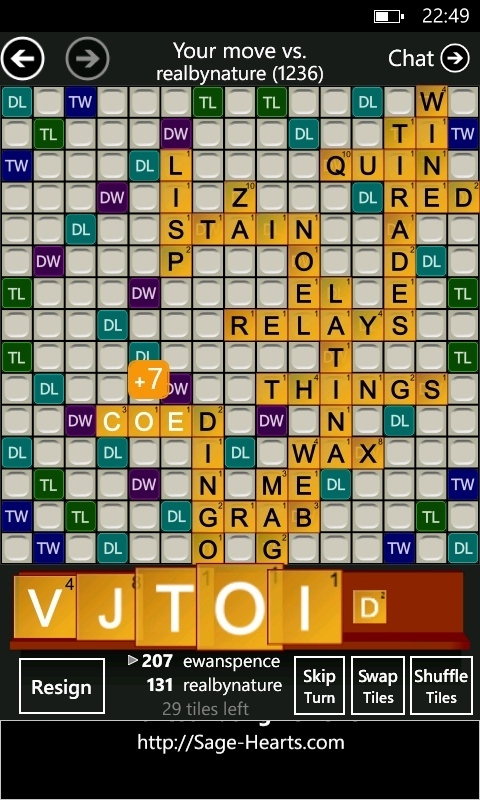 Champion Scrabble players will need to take careful note of the new layout of bonus tiles (they are not symmetrical), and everyone else needs to remember that the big scores aren't always from the longest words, but the words that use these bonus squares as efficiently as possible. Putting a word down when it is your turn is as simple as dragging the tile to the board, and hitting submit - the game will check if the words are valid, and if they are, your move goes up to the server, ready for your opponent to make their move. 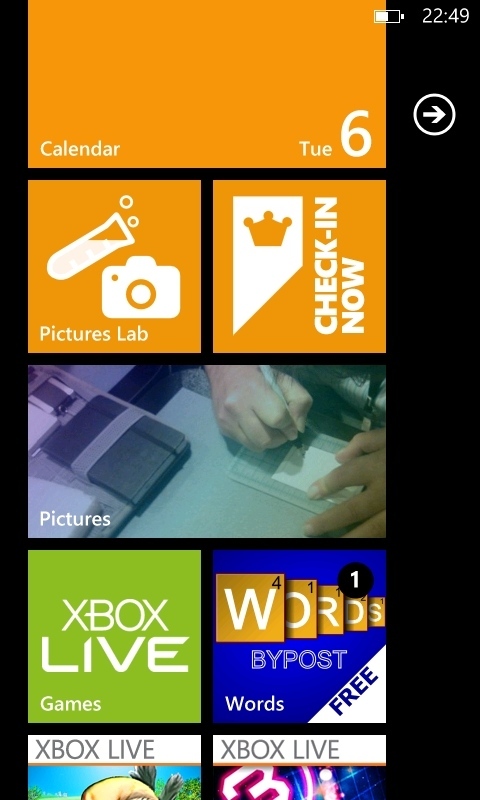 Tiles can be rearranged on your letter rack just by dragging them, and you can even aimlessly shuffle the tiles with the shuffle button, or shaking your Windows Phone if that setting is turned on. As with Chess by Post, this is a no frills experience. 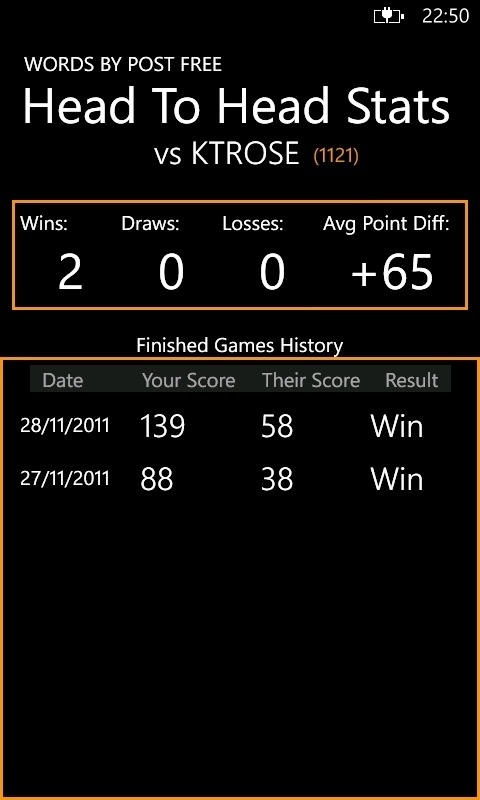 But that means nothing gets in the way of the game - and I enjoy this Scrabble-esque game more than I enjoy Chess. It feels more accessible and playable, there's always someone to play against, and it's easier to juggle more than one game in my head with Words than with Chess (where specific strategies have to be remembered). Same great interface and solid code, but a slightly better game? Definitely. Words by Post is getting a huge thumbs up from me!